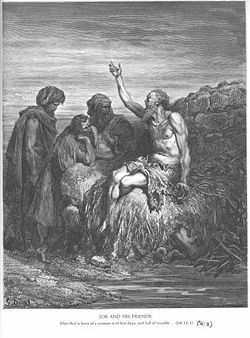 The Book of Job (איוב) is one of the books of the Hebrew Bible, describing the trials of a righteous man whom God has caused to suffer. The bulk of the 42-chapter book is a dialogue between Job and his three friends concerning the problem of evil and the justice of God, in which Job insists on his innocence and his friends insist on God's justice. The Book of Job has been called the most difficult book of the Bible and one of the noblest books in all of literature. Alfred Lord Tennyson called it "the greatest poem of ancient or modern times." Scholars are divided as to the origin, intent, and meaning of the book. Debates also discuss whether the current prologue and epilogue of Job were originally included, or were added later to provide an appropriate theological context for the philosophically challenging dialogue. Numerous modern commentaries on the book address the issue of theodicy, or God's relationship to evil. 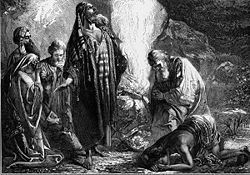 Job, a man of great wealth living in the Land of Uz, is described by the narrator as an exemplary person of righteousness. God Himself says there is no one like him, declaring him to be "blameless and upright, a man who fears God and shuns evil." (1:2) Job has seven sons and three daughters and is respected by all people on both sides of the Euphrates. Job falls to the ground upon hearing that his children have perished. One day, the angels—among them Satan—present themselves to God, who boasts of Job's goodness. Satan replies that Job is only good because God blesses and protects him. "Stretch out your hand and strike everything he has," Satan declares, "and he will surely curse you to your face." God takes Satan up on the wager and permits him to put the virtue of Job to the test. God gives Satan power over the Job's property, his slaves, and even his children. 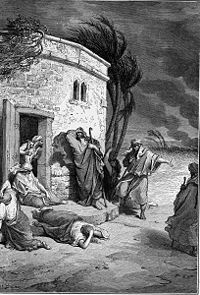 Satan then destroys all of Job's riches, his livestock, his house, his servants, and all of his sons and daughters, who are slain in a seemingly natural disaster. Soon, three of Job's friends come to visit him in his misfortune—Eliphaz the Temanite, Bildad the Shuhite, and Zophar the Naamathite. A fourth, the younger man Elihu the Buzite, joins the dialogue later. The three friends spend a week sitting on the ground with Job, without speaking, until Job at last breaks his silence. When he does so, his attitude has changed dramatically. Now apparently in touch with his deeper feelings, Job no longer blesses God or pretends to accept his fate without complaint. Instead, "Job opened his mouth and cursed the day of his birth." Job is accused by one of his friends. The debate continues through several more rounds. 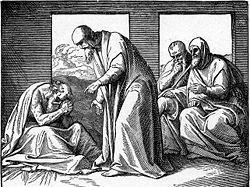 Job's friends attempt to convince him that he must be wrong, for God would not punish an innocent man. Job insists on his integrity, demonstrates his good character and works, and argues that God has done him a grave injustice. Both Job and his friends express God's attributes of power and sovereignty in majestic, poetic images that rank among the greatest in all of literature. But they remain at loggerheads as to whether God has done right to cause Job to suffer. Then summon me and I will answer, or let me speak, and you reply. How many wrongs and sins have I committed? Show me my offense and my sin. After this, the relatively young Elihu, who has not been previously introduced, delivers a long speech, uninterrupted, for six chapters (32-37). (Many believe Elihu's speech is a later addition, inserted between Job's final declaration and God's response, which naturally follows immediately after Job's words are finished.) Elihu becomes "very angry with Job for justifying himself rather than God." But he is also angry with the three friends, "because they had found no way to refute Job." 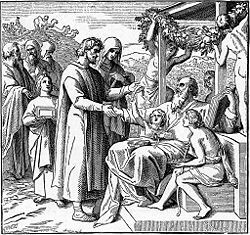 Speaking with the confidence of youth, Elihu claims for himself a prophet's wisdom and condemns all of those who have spoken previously. In his defense of God, however, he seems to offer little new, echoing Job's other friends in declaring, "It is unthinkable that God would do wrong, that the Almighty would pervert justice." 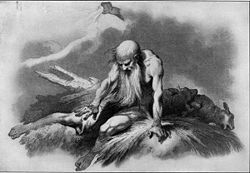 What is novel in Elihu's approach is that it underscores the idea that Job's position is flawed because Job presumes that human moral standards can be imposed upon God. In Elihu's opinion, therefore, "Job opens his mouth with empty talk; without knowledge he multiplies words." No one is fierce enough to rouse him. Yet, surprisingly, God sides with Job and condemns his three friends because "you have not spoken of me what is right, as my servant Job has." (42:7) God appoints Job as their priest, commanding each of them to bring Job seven bulls and seven rams to him as a burnt offering. Soon, God restores Job completely, giving him double the riches he before possessed, including ten new children to replace those Satan had earlier murdered under God's authority. Job's daughters are the most beautiful in the land, and are given inheritance while Job is still alive. Job is crowned with a long and happy life and, 140 years after his trials, "died, old and full of years." The basic theme of the Book of Job is the question of theodicy: how does God relate to the reality of evil? While there are several ways to deal with this crucial philosophical problem, Job focuses on only two basic possibilities. Since all parties in the dialog affirm that God is all-powerful, either God must be just, or He must not be just. The book does not deal with the possibility that God does not exist or that God is not all-powerful. In the end, the basic question of God's justice is not clearly answered. God simply appears and asserts His absolute power and sovereignty, and Job repents. One would think from this outcome that Job's fiends were in the right: Job had sinned, and only the appearance of God brings him to the admission of this. Yet God affirms quite the opposite, namely that Job has spoken "what is right concerning me," while Job's friends have spoken wrongly. Whether intentionally or not, this resolution is a brilliant literary device, for rather than answering the issue for the reader, it serves to make the book's essential paradox more intense. God is clearly all-powerful, but still righteous men suffer. Job repents when he finally confronts God, and yet Job has spoken "what is right" in questioning God's justice. 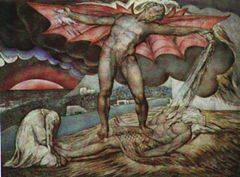 One of William Blake's portrayal of Satan afflicting Job with boils. The framing story complicates the book further: in the introductory section, God allows Satan to inflict misery on the righteous Job and his family. The conclusion has God restoring Job to wealth and granting him new children, in what some critics describe as a half-chapter "fairy-tale ending" to a long theological dialogue that rivals even Plato for its length and depth. But does a parent ever forget the pain of lost children? How God could test a righteous man so unjustly remains a subject of intense debate to this day. It should also be noted that while the traditional Christian perspective affirms the prologue's character, Satan, to be the Devil, he is actually presented here as "the satan" (ha-satan, 'the adversary'). "Satan" thus does not seem to be a personal name. 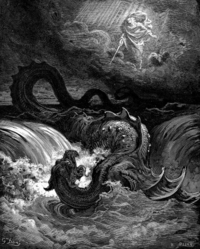 Moreover, he appears not as the adversary of God, but of man. Indeed, Satan is actually God's agent, employed by Him to test Job's faith. Carl Jung, Answer to Job—A psychological analysis affirming that the ultimate archetype of God embraces both good and evil. Harold Kushner, When Bad Things Happen to Good People—A contemporary Jewish analysis raising the possibility that God is not all-powerful after all. Alfred Lord Tennyson called the Book of Job "the greatest poem of ancient or modern times." Despite its theological challenge to God's justice, certain sections of the Book of Job have become extremely important to traditional religious teachings. Preachers, seeming to ignore Job's oft-repeated complaints throughout the dialog portion of the book, frequently point to Job as an exemplary man of faith, who refuses to curse God even after he has lost his wealth, his possessions, and his children. One of Job's more hopeful declarations is also used, particularly by Christian preachers, to demonstrate Job's faith in the resurrection of the dead at the second coming of Christ. Job 10:21-22: "I go to the place of no return, to the land of gloom and deep shadow, to the land of deepest night, of deep shadow and disorder, where even the light is like darkness." The Book of Job is clearly in the category of Wisdom Literature, along with Psalms and Proverbs. However, it rejects the simplistic moralistic formula of most of these writings, grappling with the problem of evil and suffering in a manner more akin to the Book of Ecclesiastes. Most modern scholars place its writing around the time of the Babylonian exile. Traditionally, the Talmud (Tractate Bava Basra 15a-b) maintains that the Book of Job was written by Moses. However, there is a minority view among the rabbis that says Job never existed (Midrash Genesis Rabbah 67; Talmud Bavli: Bava Batra 15a). In this view, Job was a literary creation by a prophet to convey a divine message or parable. On the other hand, the Talmud (in Tractate Baba Batra 15a-16b) goes to great lengths trying to ascertain when Job actually lived, citing many opinions and interpretations by the leading rabbinical sages. Whatever the story's origins, the land of Edom, has been retained as the background. Some of the rabbis therefore affirm Job was one of several Gentile prophets who taught Yahweh's ways to non-Israelites. What in one's heart is contemptible, to one's God is good! Who can understand the thoughts of the gods in heaven? The counsel of God is full of destruction; who can understand? Where may human beings learn the ways of God? Various additions are thought to have been made to the current text of Job. For example, the speech of Elihu (Chapters 32-37), is thought by many to be a later addition, inserted between Job's resting his case and God's answer to him. Job's later life: a "fairy tale" ending? The prologue and epilogue are also thought to have been added by a later editor to provide a more acceptable context for the theologically disturbing dialog. 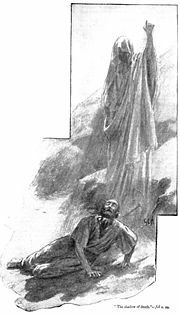 The prologue is meant to show that Job's suffering is merely a test provoked by Satan rather than an unjust punishment from God, as the dialog suggests. The epilogue provides a happy ending in which Job lives happily ever after with his wife and a new set of children. This final chapter is seen by many literary critics as analogous to Walt Disney's "happily ever after" solution to the originally more troubling endings of some of his fairy tales. A debate also exists over the proper interpretation of the last line that Job speaks (42:6). Traditional translations have him say, "Therefore I despise myself, and repent in dust and ashes." The word "myself," however, does not appear in the Hebrew. Some argue that in the context of Job's story and character, what he despises may not be himself, but his life; and his "repentance" in dust and ashes refers to his continued mourning the day of his birth, which he has been doing quite literally throughout the dialogue. ''Young's Literal Translation'' gives the verse as: "Therefore do I loathe [it], And I have repented on dust and ashes." The Testament of Job, a book found in the Pseudepigrapha, has a parallel account to the narrative to the Book of Job. It contains legendary details such as the fate of Job's wife, the inheritance of Job's daughters, and the ancestry of Job. In addition, Satan's hatred of Job is explained on the basis of Job's having previously destroyed an idolatrous temple, and Job is portrayed in a much more heroic and traditionally faithful vein. ↑ Ludlul Bêl Nimeqi www.fordham.edu. Retrieved July 10, 2007. Eby, Lloyd. “The Problem of Evil and the Goodness of God.” in Antony J. Guerra, ed., Unification Theology in Comparative Perspectives. Unification Theological Seminary, 1988. All links retrieved May 9, 2018. Judaica Press Complete Tanach: Job translation with Rashi's commentary Chabad.org. Excerpts from "Answer to Job" by Carl Jung jmm.aaa.net.au. (Carl Jung - "Answer to Job" in The Portable Jung, Edited by Joseph Campbell. Penguin, 1971. The Catholic Encyclopedia Job. www.newadvent.org. History of "Job, Book of"
This page was last modified on 9 May 2018, at 16:11.